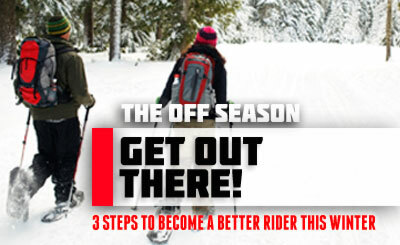 3 steps to Become a Better Rider this Winter. Hey you! Yeah you. Sitting there at your computer. If you aren't doing some sort of off season workout then you don't really care about improving as a rider. No one gets better by staring at bike magazines or watching other riders tear it up in a video. You need to get out there! Follow these 3 steps to help you maintain your physical fitness throughout the winter months and bring you eager and motivated for the coming spring! Find A Workout That Works: The first place to start is by developing a workout that will fit your schedule and your fitness needs. Anything from Insanity in your basement to joining a local gym. Many people find classes to help keep them motivated. Programs like Spin Class or Cross Fit are very popular for this reason. Cross Fit is notorious for working all the major areas of fitness in one short, intense class that can also offer great camaraderie as a social event that also helps keep you motivated. Stay Positive: The winter can be a long few months when you are struggling to motivate every other day for a routine workout. Staying positive is critical to your success with staying in shape. A positive attitude will help the time during your workout go by much faster and leave you feeling renewed. Have Fun: Just because old man winter is hanging around does not mean you can not get outside and enjoy the weather. Cross country skiing, snow shoeing, alpine skiing and snowboarding are terrific ways to stay in shape while having fun during the winter months. If you are new to any of these sports consider a lesson as it will give you the knowledge to be able to enjoy the sport that much more. Hopefully these tips will help. What are you doing this winter to improving as a rider? Indoor riding will never replace the feeling of ripping up some sweet single track. It's hard to impossible to recreate nature in its fullest from a Mountain bikers prospective. But you can take all the things you love about Single Track riding and condense them into a very enjoyable experience. Working on your skills improves your confidence and adds flow to your everyday biking ability. Either be berms, skinny's, rocks, logs and yes, Jumps! And where better to work on this than the Ray's MTB Indoor Park. The world's First Indoor MTB Park. Ray's MTB Park is located in Cleveland and boasts a 135,000 sq ft wall to wall dream for any MTB bike enthusiast. The park was made with the intention of satisfying the need for bikers to keep up their riding during the winter months. And who better to build it than Ray Petro, a Mountain biker himself with background in design and a carpetener by trade. And it shows. Every inch of the space is pure bike heaven. At times it's hard to tell that there is even concrete under all the wood trails. This is no doubt a stop that every rider should make. This has turned into an annual visit for some of the CTS crew. And for good reason. This is the first ever indoor Mountain Bike Park. The cost for the weekend is a lot better than one would expect with Hotel deals and with the Canadian Dollar almost par with the U.S. For a weekend trip with Fuel, Hotel, and 2 day Park pass will set you back about $160. Rays is the foundation of what other indoor parks inspire to be. So do what you have to, but plan now for next year's trip. 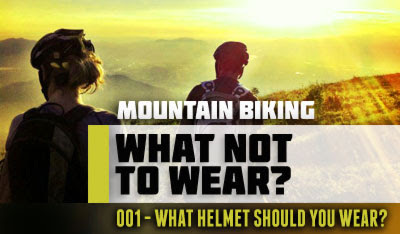 What helmet should you wear? Wile a rider has the right to wear any helmet they want, many don't know what they are missing. Wearing the right protective gear on you head is beneficial, not only from a fashion standpoint, but functionally as well, apart from keeping your head in one piece. Unsuitable: No Helmet, the trails are a lot harder then your head. lose the ego and buy a helmet. As well, skateboard helmets don't meet the same standards as cycling helmets. They are rated for slow-speed impacts. You will also feel the lack of ventilation on those hot days. Ideal: A well-vented, lightweight helmet is ideal. A helmet without a visor for cross-country riding. The aggressive position on a cross-country bike makes a visor often obstruct the field of vision. All-mountain bikes provide a more upright position, therefore a visor is great for keeping the sun out of your eyes. Down-hill riding offers a whole new level of danger to you head. When riding DH make sure to get yourself a full face to save your smile. Visualization and mental imagery of your line can truly boost your riding performance and consistency on the trail. More over, the intents focus on the next twenty feet of trail can truly clear your minds when things are weighing you down. You have tens of thousands of thoughts every single day. Your mind simply won’t shut up. 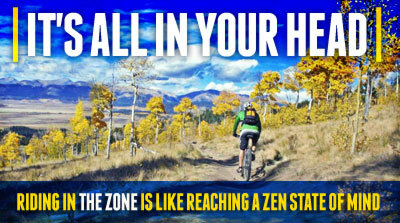 Mountain biking has the amazing ability to keep you in the "Now". I’ve found this unintentional focus to be very powerful. Your mind becomes at ease and you find yourself in "The Zone" and all your thoughts of the day or what you have to do when you get home are gone. Riding uses all of your senses to really feel your current state of being and your potentially hazardous surroundings. Let go of the past, forget about the future, feel that you are alive right now! Indoor riding will never replace the feeling of ripping up some sweet single track. It’s hard to impossible to recreate nature in its fullest from a Mountain bikers prospective. But you can take all the things you love about Single Track riding and condense them into a very enjoyable experience. 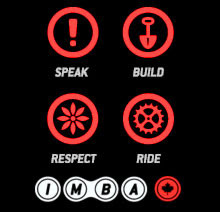 Working on your skills improves your confidence and adds flow to your everyday biking ability. Either be berms, skinny’s, rocks, logs and yes, Jumps! And where better to work on this than the Ray’s MTB Indoor Park. The world’s First Indoor MTB Park. Ray’s MTB Park is located in Cleveland and boasts a 135,000 sq ft wall to wall dream for any MTB bike enthusiast. The park was made with the intention of satisfying the need for bikers to keep up their riding during the winter months. And who better to build it than Ray Petro, a Mountain biker himself with background in design and a carpetener by trade. And it shows. Every inch of the space is pure bike heaven. At times it’s hard to tell that there is even concrete under all the wood trails. It’s not hard to think that this place is geared toward the Dirt Jump Freaks, but this is simply untrue. The cross country loop is epic and challenging with options at every corner. With rocks and logs located threw out. It’s not hard to ride for days and not do the same thing twice. The loop has flow that challenges every rider’s ability. The Pump track is not something you see in our typical Tuesday’s rides. This total body workout will sharpen your overall bike skills and push you to generate power and speed. Using the bumps and Berms to will teach you more than you know till the next time you’re out on that single-track. This is no doubt a stop that every rider should make. This has turned into an annual visit for some of the CTS crew. And for good reason. This is the first ever indoor Mountain Bike Park. The cost for the weekend is a lot better than one would expect with Hotel deals and with the Canadian Dollar almost par with the US. A weekend with Fuel, Hotel, and 2 day Park pass will set you back about $160. Rays is the foundation of what other indoor parks inspire to be. So do what you have to, but plan now for next year’s trip. 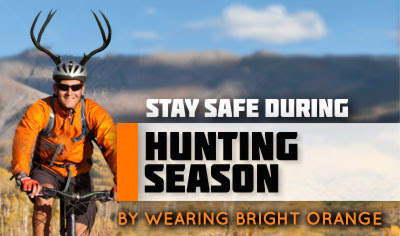 The safety of trail users who are non-hunters during hunting season is a concern to many. With gun-toting hunters returning to the woods this fall, take precautions to stay out of their sites. The onus of safety in the woods is largely on the part of the hunter, but why take the risk. 1. Be aware of hunting seasons in your area and try to avoid them, especially at dawn or dusk. 2. Wear bright colours that can not be mistaken for wildlife. It is safest to wear bright orange, and items that make noise while riding. like my old bike. Caution: red and green can appear brown at dawn or dusk and white can resemble a deer’s tail through the woods. For information about hunting seasons and regulations, please consult the Hunting Regulations Summary on the ministry's website at ontario.ca/hunting.